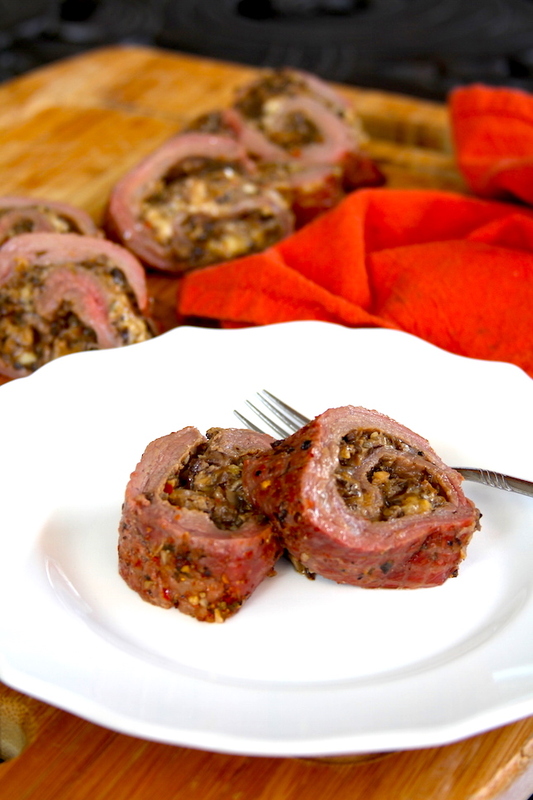 Very simply, the term roulade refers to rolling meat. This simple idea is a fantastic technique that can be translated to a variety of meats. In fact, we’ve visited this idea a few times in the past. The Southwestern Stuffed Pork Loin, Chicken Spedini, and Turkey Roulade are great examples. 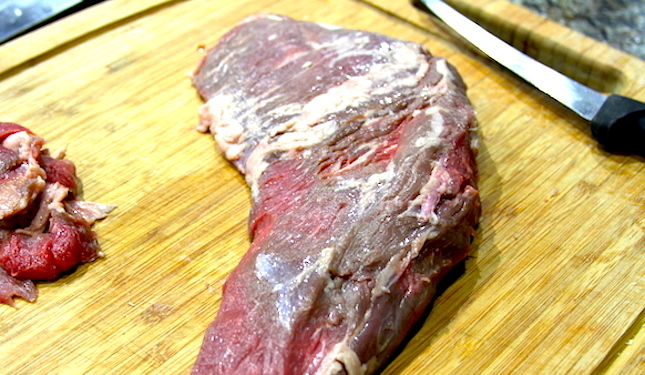 When it comes to beef roulades, flank steak is usually top dog. We, however, are kind of crazy about tri-tip right now, even if it will require a little extra effort in this application. This recipe will take a whole tri-tip roast, sliced horizontally and meat glued together to give us something similar to the shape of a flank steak. Let’s talk for a minute about “meat glue.” Transglutaminase, or as it’s commonly known, “meat glue,” is a naturally occurring enzyme that bonds together proteins. In culinary applications it aids in the production of everything from imitation crab meat to chicken nuggets to whatever frankenstein creation we food adventurers can imagine. 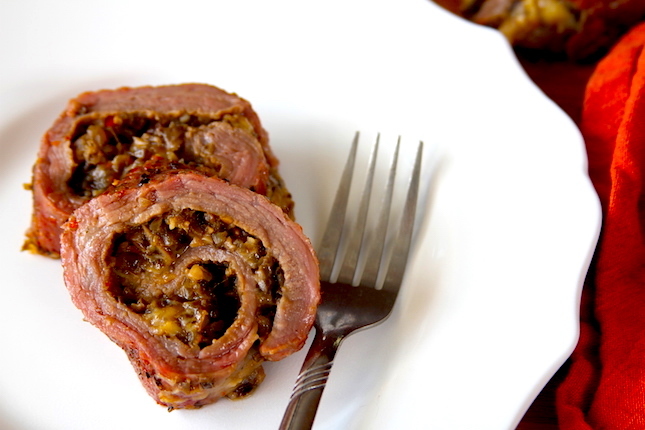 In our tri-tip roulade recipe it serves a very simple purpose. 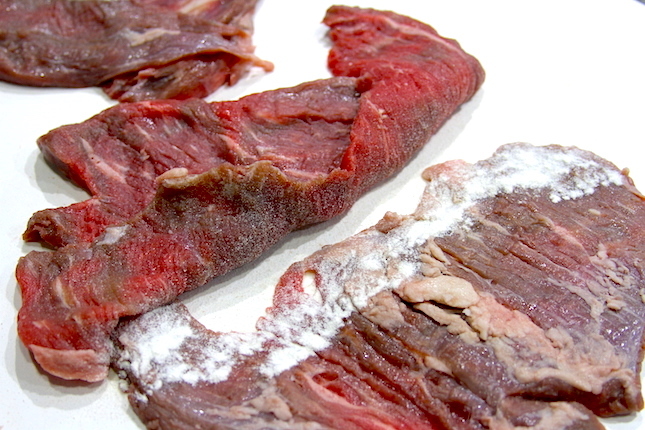 It will allow us to glue two slices of meat together to make one larger meat surface. Back to the roulade. The beauty of the roulade is that there are endless possibilities. Today we will be stuffing our roulade with caramelized mushrooms and onions and gruyere cheese, but you have the opportunity to use whatever suits your fancy. So, give this one a try. Then get to brainstorming for the next. 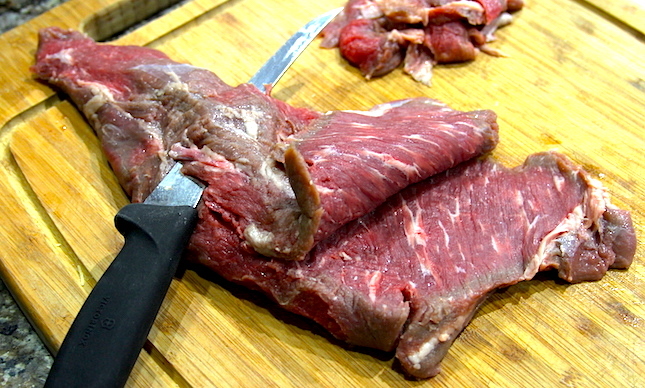 Slice the tri-tip roast into four equal horizontal slices by placing a hand flat on top of the meat and cutting horizontally about 1/2 inch down. Lay out the slices in pairs. Overlap the slices on the long side. Careful sprinkle a small amount (see photo) of the meat glue on the overlapped area, and press the meat together. Carefully transfer each pair of glued slices to its own zip-top bag and place in the refrigerator for three hours. After three hours, test the bond to see if the glue is holding. If so, add to each bag Smoke on Wheels BBQ Marinade. Divide the bottle of marinade between the two bags. Marinate one hour. Meanwhile, in a Lodge Logic 12” Cast Iron Skillet, melt the butter over medium low heat. 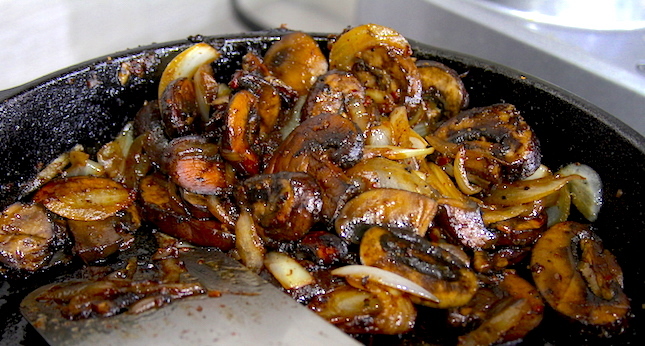 Add the sliced mushrooms and onions, as well as 2 teaspoons of Catlleman’s Grill Tri-tip Seasoning. Cook slowly until softened and slightly caramelized. Transfer to a food processor. Pulse until well chopped, but not totally pureed. Preheat your Yoder Smokers YS640 to 250ºF. Remove the meat from the marinade. 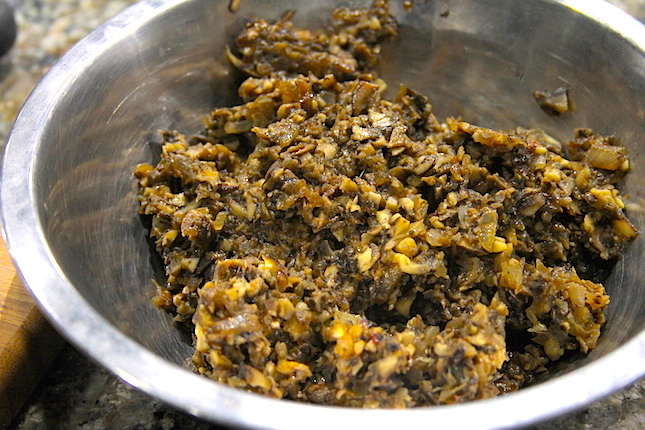 Wipe of the excess marinade. 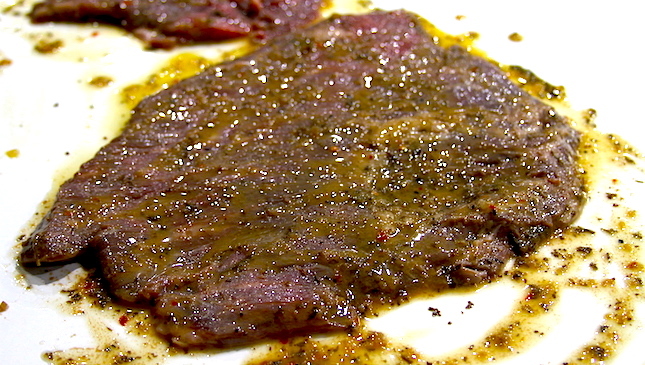 Season the surface with Catlleman’s Grill Tri-tip Seasoning. Spread the mushroom and onion mixture across the meat. 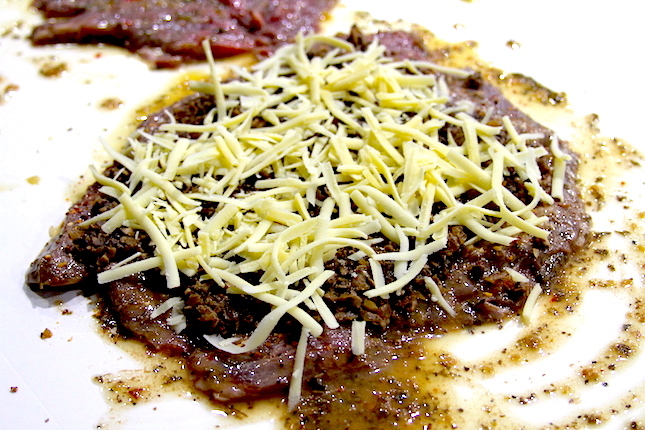 Top with the grated gruyere. 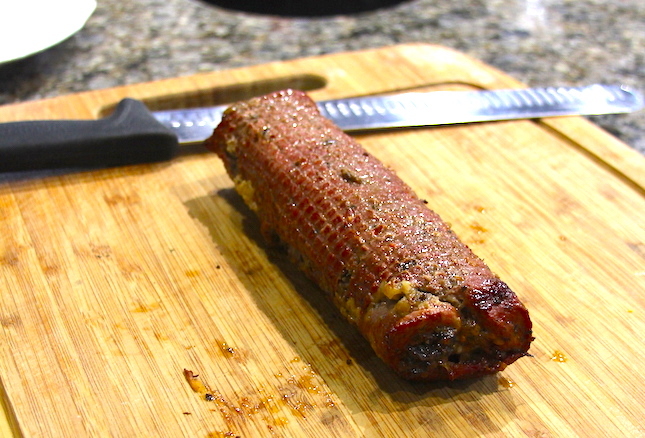 Roll the meat and toppings tightly, rolling in the direction that the grain of the meat runs. You should be rolling in the direction that results in a long roulade. Do not roll against the grain of the meat (a shorter roulade). Place the roulade on a FrogMat and roll the mat around the roulade. Alternatively, use butcher’s twine to tie the roulade every 1”-2”. Transfer the roulade to the smoker. 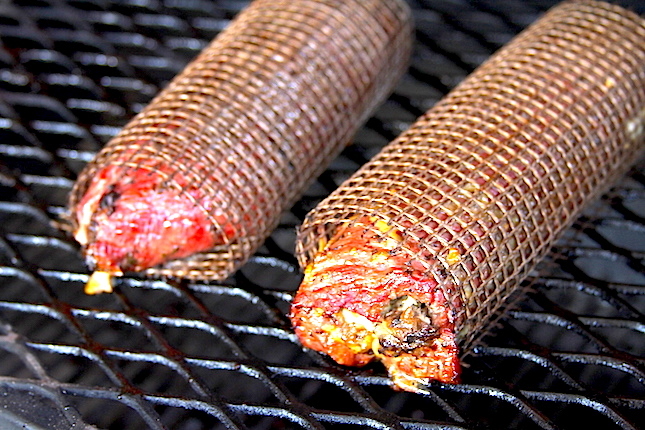 Smoke until the internal temperature reaches 130ºF. Remove from smoker. Rest 10 minutes. Remove roulade from the FrogMat and slice to serve.